CES 2019, as you would expect, talks increasingly about electrified vehicles, connected automobiles and autonomous driving - the future of mobility as the industry sees it. This progress is also rapidly merging automobiles and consumer electronics, which explains why CES has more exciting automotive concepts lately, compared to most other motor shows in the US. That also means that automotive architectures of the near future could form their own ecosystems quite simply like an Apple or Android and therefore, their acceptance levels will define the roadmap for the development of all allied technologies and business. Expectedly then, it is now a race between OEMs/solutions providers to come out with these ecosystems sooner than later for carmakers and consumers to adapt. ZF has managed to put itself in a strong position in this race, readying the solutions required for cars of the future. While the German giant with over 100 years of expertise is already one of the strongest players in transmissions, steering systems, chassis control, active/passive safety modules etc. it is also a leader in sensor technology and boasts of being the largest supplier of cameras for automotive applications. ZF's collaboration with Mobileye has resulted in state-of-the-art high-resolution camera, radar, and lidar solutions. Cameras, radar and lidar are some of the most important components for autonomous driving as they help the car see and analyse the surroundings. Since autonomous cars will need to see and consume more information than human drivers and analyse the data faster than the human brain, high computing power is imperative. This is where Nvidia comes in. With its Drive AutoPilot, Nvidia will bring an autonomous Level2+ computing solution to carmakers next year and it chose to partner with ZF to meet that ambitious timeline. Using the Nvidia Xavier chip that brings the chipset and software expertise, ZF has created a supercomputer ECU called the ProAI RoboThink. 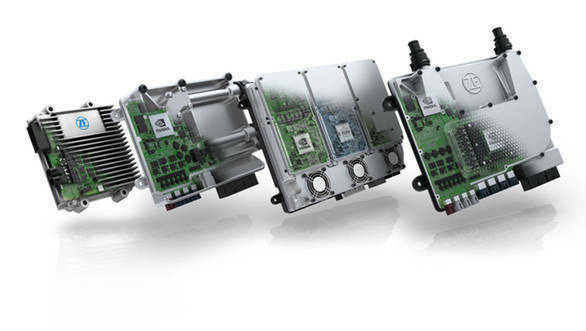 The ProAI family to ECUs from ZF are available in various versions ranging from a base model that is ready for all the ADAS safety tech like automated braking and city pilot that are mandated by the NCAP norms for 2022; all the way up to the RoboThink which can process up to 600 teraops for Level 5 autonomous driving using ZF's advanced sensor-set. All these ProAI solutions are scalable, and the range-topping RoboThink will be production ready by the end of this year. 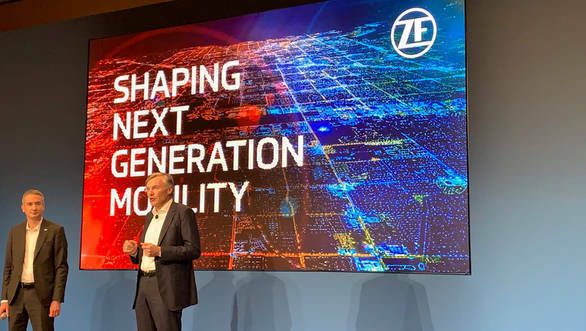 ZF is proud of the fact that it's autonomous and connected driving solutions aren't just show-floor concepts anymore and are ready for series production by as early as 2020. 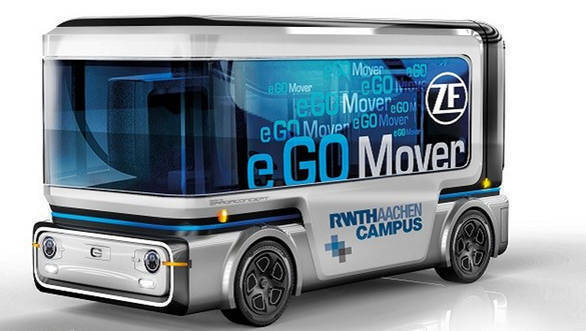 To that effect, ZF is partnering with electric vehicle manufacturer e.Go and mobility solutions provider and integrator, Transdev, to put into production a fully autonomous electric vehicle platform called the e.Go Mover. Catering to people-carrying and cargo-hauling applications, the e.Go vehicles will be ready by 2020 to operate in geo-fenced real-world locations. While the computing power comes from the ProAI architecture, the supervision of the Mover's on-road operations will be handled by Transdev. ZF aims to reach a five-digit figure for these Movers by 2021 and projects significant growth in demand of such robo-taxies by as early 2022. ZF as a brand is also undergoing transformation by being more digital in its approach and processes. As a part of this digitisation process, ZF has developed an IoT (internet of things) platform to further enhance the scope of its components and solutions. The ZF IoT platform creates a cloud ecosystem that collects and analyses data and opens opportunities for predictive maintenance, reduction in vehicle downtime, advanced tracking and safety solutions and even the ability to enhance the feature set of components with over-the-air updates. Partnering with Microsoft for the Azure platform, ZF has made its Cloud computing platform available for its customers since 2018. With all these solutions either on offer already, or coming up in the near future, ZF is at the forefront as a solutions provider for the vehicles of the future.